What is a vegetarian gourmet to do? Sure, there are casual restaurants that cater to vegetarians in town, but what about fine dining? Many of Santa Barbara’s excellent restaurants feature only a single vegetarian entree, if that, and many figure that grilled vegetables on top of pasta is a satisfying meal. One answer, an answer good enough to last several lifetimes, is SpiritLand Bistro (230 E. Victoria Street, 966-7759). A vegetarian will notice the menu right away, which does not make you scan for a handful of meatless dishes. Indeed, though they also serve organic poultry and Audubon-approved fish, vegetarian and vegan dishes dominate. 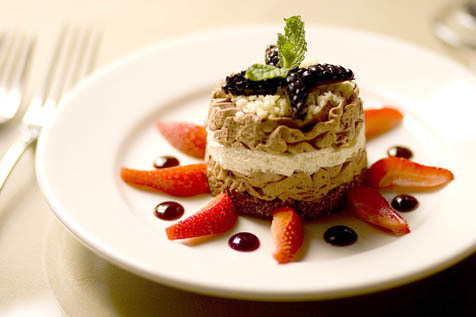 The food itself features the sophistication and intensity one expects from the finest dining. Chef Joel Koch clearly understands that our pleasure of food comes not just from taste, but also from texture, from presentation, and from chemosensory excitation. Every dish we ate impressed not just in one or two of these areas, but in all four simultaneously. Contrasts did not merely play skillfully off each other to catch and keep our attention. Rather, the chef consistently pushed beyond this feat into moments of mystery, surprise and paradox. Just as I started to swoon over the eggplant cooked into a blissful state of mellowness in the Mediterranean Fusion, the bed of piquant leeks beneath it woke me right back up. The Raw Spinach Mushroom Lasagna was the freshest, most alive thing I think I have ever put in my mouth. And the Chocolate Mousse Cake with its crust of almonds – I think I just made a noise that was downright unladylike. Was it gauche to eat each and every garnish throughout the meal? Oh well, I lost my head. As you’d expect in a place that is entirely organic, even the smallest bits of produce were impeccable. On the way home in the car my companion and I played “when was the last time you had a meal that good?” I seemed to remember a meal at The French Laundry in Napa sometime back in the nineties, before I’d become a vegetarian. My companion, poor thing, couldn’t remember anything, and he hasn’t exactly been living a sheltered life.